A new job for plastic sorting employees: sort e-waste! Can clean up disaster areas! We now have the technology to recycle EVERYTHING in your local tip. Imagine all the disgusting things in your local council land fill. Rotting food and pizza boxes, a teenager’s worn down joggers, bits of hose and rubber, soggy old mattresses, disposable nappies, lawn clippings, maybe some old asbestos and toxic chemicals in old paint tins, and ten million bits of plastic junk from broken sunglasses and worn out toothbrushes to bits of bottles, lids, pegs and other miscellaneous clutter. We can just dump it all into a Plasma Arc Burner which is described as lightning on a stick. Rather than burning it in normal oxygen-rich air and oxidizing it into ash, the Plasma Arc runs in a low oxygen tank. This rips the waste apart at the molecular level and sorts it into light gases and heavy solids. The light gases are for the petrochemical industry and make everything from sunglasses and toothbrushes to motor lubricants and varnishes. The heavier slag slurps out the bottom like lava, and can make everything from bricks and roof tiles to fluffy rock-wool insulation and faux wood panels. In other words, the Plasma Arc Burner recycles household rubbish into about half the materials necessary to build the next house or car or boat! 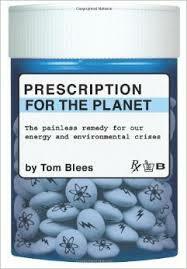 Dr James Hansen promotes this in his friend Tom Blee’s book, Prescription for the Planet. This is now a free PDF at the link below. Chapter 7: Exxon Sanitation Inc, p189. The syngas shoots out the top at such high temperatures that it drives a steam-turbine as it passes through various cooling stages, and then the gas can become a feedstock for the petro-chemical industry. The Plasma Arc Burner is 3 times hotter than the surface of the sun! The petro-chemical industry can then refine it into the raw ingredients for paint, varnish, lubricant, glue, and a million other toothbrushes and sunglasses and pegs and widgets. Instead of mining oil out of the ground, mine our local landfill to meet our chemical needs. Some people recommend burning the Syngas to power the Plasma Arc Burner, but I think this syngas is more valuable to the petro-chemical industry. Nukes can give us all the clean electricity we could ever want: but CO2 neutral petro-chemicals are another story. can be mixed with plastics (from the Syngas!) to form ‘glass reinforced plastic‘, which is yet another whole category of building material. Plasma burners could let us just use one very large bin for all our waste. But that’s lazy. We want to recycle some of the potential food nutrients and fibres where possible. If we recycle paper and glass and some organics, we can reduce logging and sand mining and nutrient loss in local farms. I propose running things in almost the same way that our local Shire does with 3 bins. a regular RED bin for all non recyclables household waste such as dirty diapers, pizza boxes, old shoes, and all plastics. Gone are the regular plastics recycling centres where dozens of people stand next to conveyor belts sorting different qualities of plastic all day. Yuk! They can have more dignified work. Instead, we just dump all plastics into the plasma burner together. It recycles everything. a large GREEN bin for recycling all organics: lawn clippings and yard and even kitchen peelings and restaurant scraps. It can all be composted down into soil. This would dramatically increase nutrient recycling and top up local farm soils where transport costs are not too high. a large YELLOW bin to recycle paper, glass, and tin the conventional way. Even if everything is thrown into the one large waste bin, there are now industrial strength garbage sorting centres that quickly sort all the rubbish into different categories. Global renewables have one right here in Sydney. See video below. 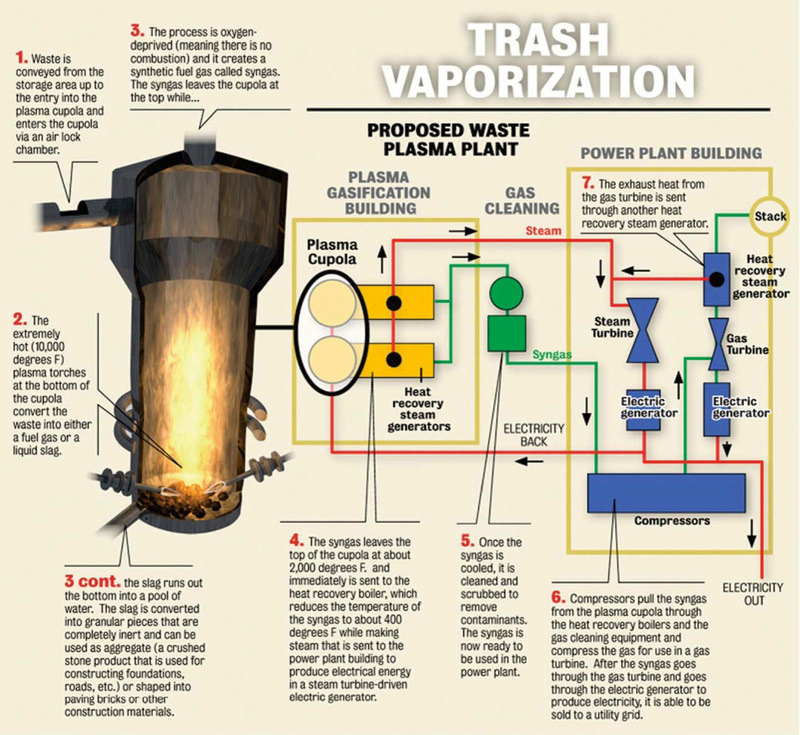 Real waste and plastics can go through the plasma burner, paper and glass and e-waste gets recycled, and organics? They are composted with their unique giant mix-master and turned into an soil medium 3 times richer than backyard garden composts. This could offset some of the peak phosphorus problem I’ve covered under Replenish the oil. Step 4: The rich organic fraction is then composted using technology from Global Renewables’ partner Sorain Cecchini Tecno (SCT), one of the few composting systems able to produce high quality compost from mixed waste in a fully enclosed, automated and process controlled system. Step 5: The SCT Biomax composting system processes the rich organic fraction for two weeks under highly controlled conditions of mixing, watering and aeration to produce a pasteurised compost material which is ready for final refining. Step 6: The refining process has been specially developed by Global Renewables to meet the stringent NSW Environment Protection Authority resource recovery exemption requirements. Global Renewables’ compost refining technology combines aerodynamic and mechanical screening, metal removal and milling unit operations to remove stones, metals, glass and light plastics and produce the OGM™ product (Organic Growth Medium), our compost is suitable for agricultural and mining rehabilitation applications. After a further external maturation period with intermittent turning, the OGM™ is ready to be delivered to market. 5. A new job for plastic sorting employees: sort e-waste! As e-waste is now such a big issue, I personally think the YELLOW bin should also sort e-waste. We would still need local places to drop off TV’s and Computers. But why can’t we re-employ the now obsolete plastic sorters to sort e-waste? Think of all the mobile phones, old Playstations and mobile devices, power cords and adaptor gizmos that all have rare earths in them! There’s ample employment opportunity for our next generation of ‘Recycling technicians’. Why on earth would we have them sorting through various categories of plastic when the whole lot can be dumped into ‘lightning on a stick’ and sorted at the atomic level? Instead, we need these valiant workers to sort our electronic trash, and reclaim the gold and telenium and platinum and gallium! We also need more E-waste dumping spots. The last time I gathered all our extended family’s e-waste to take to our nearest TV/Computer bits recycling place, it was an hour long round trip! 6. Can clean up disaster areas! Please read Tom Blees chapter on the other uses for the plasma burner. He has a remarkable ability to brainstorm new uses for things, such as how a mobile Plasma Burner truck fleet might help clean up a flooded town! Imagine New Orleans after Cyclone Katrina. Image all the old tennis shoes, sewerage, dead animals and toxic waste all locked up in the mud and fallen trees and debris of a drowned town! Tom imagines sending in the bulldozers to just scoop it all up and rip it all back into useful products. Is an old landfill leaking? Apply in-situ down a drill hole. Siphon the gas off the top, as they already do for coal-seam deposits, and the slag just dries where it is, effectively locking away all contaminants. Blees describes how the US government solved a nuclear-waste issue with the plasma burner. It did not reduce the radioactivity of the materials, but at least locked up the radioactive particles in this safe vitreous form, effectively entombing it in synroc forever. It will be interesting to watch how society adapts to these new technologies, and the other uses and applications we come up with from the waste products. The goal to me seems to be a simple ‘industrial ecosystem’. As ‘Cradle to Cradle‘ founder William McDonough says, “waste = food”, where all biological waste and industrial waste is fed back into their biological and industrial systems. This is great! Bio-nutrients should be reintroduced to farming. All all industrial waste should be fed back to industry as raw materials. We want to eliminate landfill. We also want to reduce mining, logging, and pollution. That is the goal anyway. I just disagree with their program. ‘Cradle to Cradle’ says “waste is a design flaw”. I agree, it is a design flaw of the garbage systems we have in place. But McDonough seems to focus on it being a design flaw of the product itself. His goal is worthy: designing products that are easier to recycle, right from the beginning. He helped a German company design carpets that replaced all the toxic dye’s with biodegradable, safe colours. The carpet eliminated toxins so well that off-cuts and scraps of carpet are used as mulch in German vineyards! I applaud this kind of radical, ‘clean product’ design! McDonough then explores ecocity designs where all biological waste, including sewerage, make it back to the farmlands. When I first heard McDonough’s TED talk I cheered! The concepts are great, and so self-evident. Sadly, it’s the implementation of his program that I find unworkable. McDonough’s system also seems incredibly complex to introduce. For example, he worked on producing a ‘Cradle to Cradle’ running shoe with Nike. With ‘waste = food’ in mind, he designed a shoe that had a number of components that had to be manually disassembled by hand, split up, and shipped off to various locations to be recycled. That’s labour intensive. That’s man hours! That’s complicated and expensive. I think we can do better. So I applaud their emphasis on ‘green chemistry’ and reducing the toxic load in our products and materials. I applaud their concepts for city design. But as we have seen, Plasma Arcs are a radical new technology that lets us focus on simple recycling of the waste stream, rather than too much fiddling with the product. So let’s keep it simple, and give Big Oil a reason to change their practices as well.